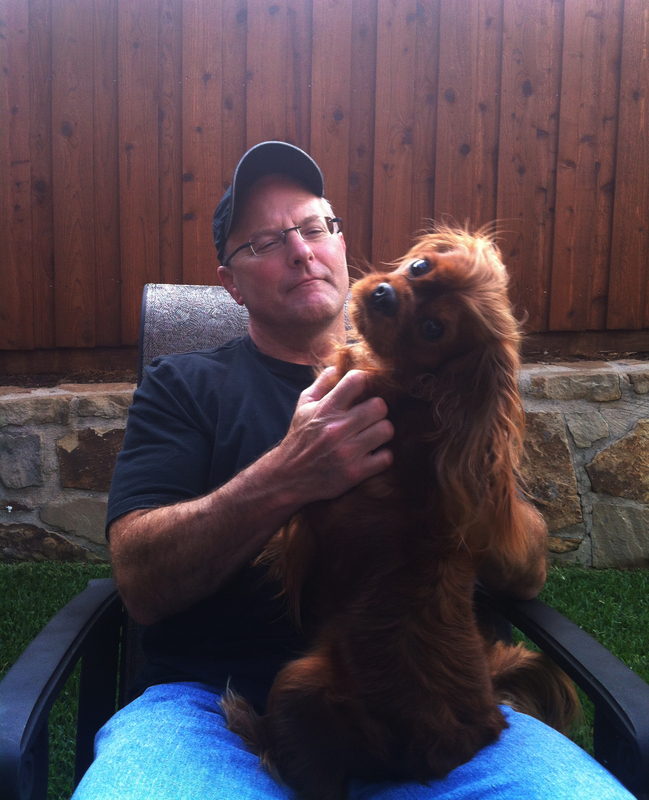 Anyone who loves Cavaliers has been following this tragic turned triumphant story. On Saturday, a full-court press conference celebrated Nina reuniting 21 days later with Bentley. What you might not have seen is that Nina, when beginning to speak at the podium, hands Bentley to Dallas Mayor Mike Rawlings. A perfect PR opportunity … mayor + dog = votes. In true Cavalier style, Bentley immediately licks the mayor’s face. Wait for it. What’s his reaction? A grin and a smile. Then, he promptly shifts Bentley because he understands it will most definitely happen again. A priceless moment in more than the obvious way. Welcome home Nina and Bentley! How many people can fit into the same outfit at age 14 and then again at 35? Not me. But Parker donned his old Halloween costume, sported four years ago. He helped greet all of the trick-or-treaters in our neighborhood as well as many dressed up dogs. He was a big Halloween hit with kids, adults and our four-legged visitors. Who doesn’t take delight in a wagging tail greeting you at the end of a busy workday? Or, the purr of it kitten resting contently on your lap. For all of the people who understand the unique bond between animals and humans, this SoulPancake is for you. On a recent trip to San Diego’s Coronado Dog Beach, Parker was introduced to ocean sand and water – both of which were foreign to our land-locked Dallas dog. Coronado’s leash-free, year-round dog beach runs along Ocean Boulevard. On the south side is the beautiful Hotel del Coronado and to the north is the scenic Point Loma skyline. It truly doesn’t get much better than this. The best laid plans of mice, men and dogs. 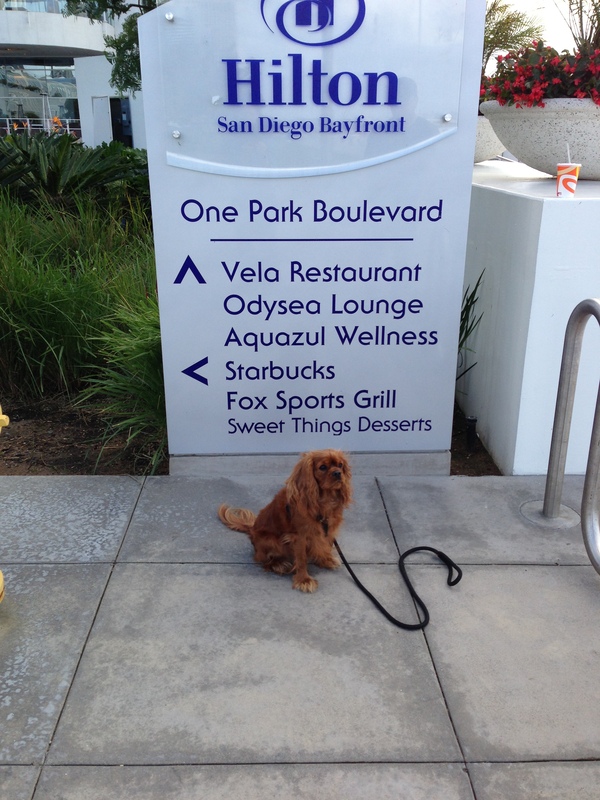 I tried to pose Parker in front of the Hilton Bayfront sign. 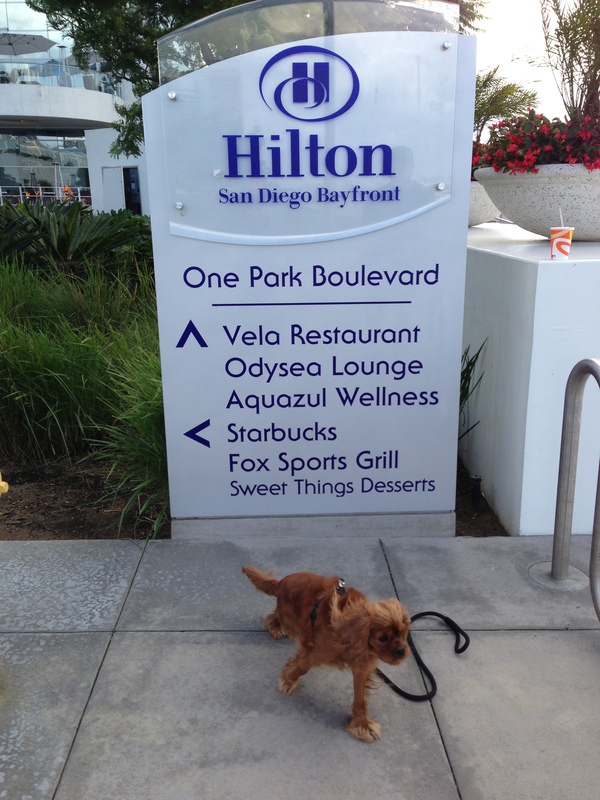 I wanted to post the photo on the Hilton Facebook page as a way to say thanks to the pet-friendly, guest-welcoming hotel management and staff. But, it didn’t turn out as I would have liked. While it’s not ready for prime-time, it had to find its way onto his blog. Take one: “Parker sit,” my husband says pointing his finger. Take two: “Stay Parker,” my husband says as Parker looks at us with inquiry as well as a little trepidation. 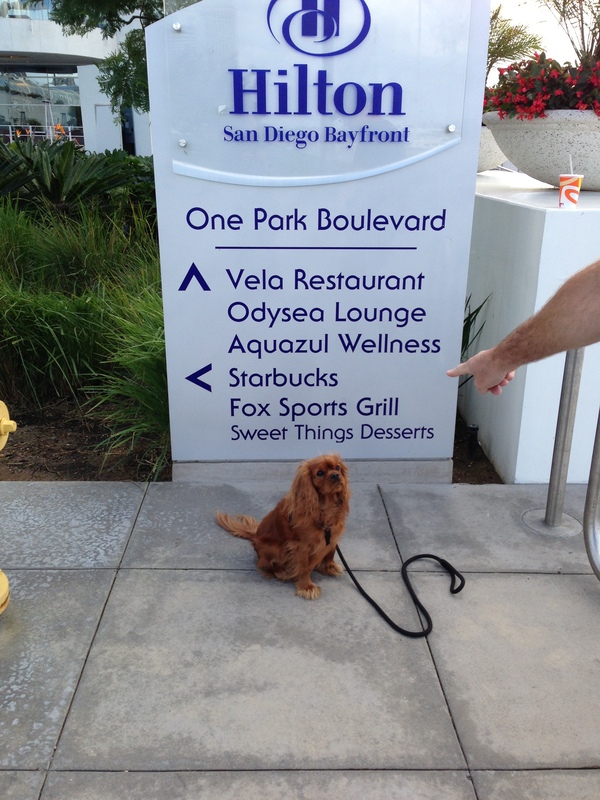 Take three: Parker dashes away, as if to say, “I’m so out of here.” If you are planning a trip to San Diego and want to stay at an amazing, pet-friendly destination, check out this hotel. We will be back! 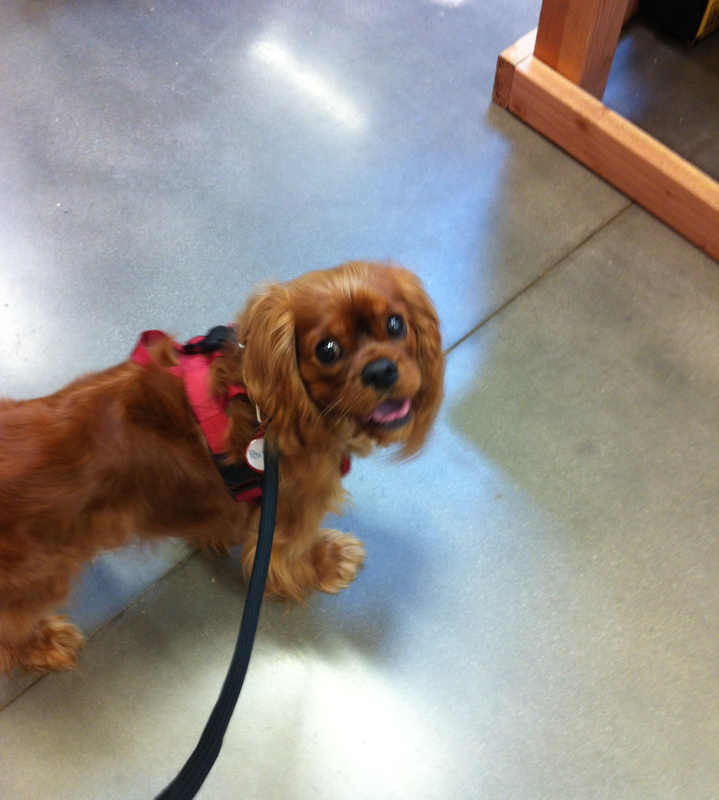 This is Parker’s “I’m happy to be at Home Depot” face. What you can’t see is his tail wagging feverishly. He struts around like he owns the place, as kids scream “puppy” and adult dog-people stop by the give him a pat on the head and a kind compliment. Given the fact summer began in March this year, the store continues to be an air-conditioned, welcome relief.